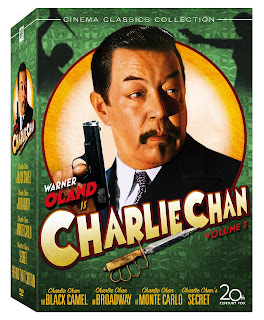 Fox Home Entertainment has announced that volume three of the Charlie Chan series will be released on Aug 13. Charlie Chan At Monte Carlo includes a Chan Is Missing: The Last Days Of Warner Oland featurette, as well as a restoration comparison, original theatrical trailers, still gallery and “Warner Oland is Charlie Chan” poster gallery. Side two features the 1929 film Behind That Curtain featuring the earliest surviving onscreen appearance of the Charlie Chan character. Charlie Chan On Broadway includes featurettes The World Of Charlie Chan and Chanograms: The Aphorisms Of Charlie Chan, as well as a restoration comparison, original theatrical trailer and still gallery. Charlie Chan’s Secret includes a commentary by film critic Ken Hanke, featurettes Charlie Chan and The Rise of The Modern Detective and Dr. Henry Lee: The Modern Day Charlie Chan, as well as a restoration comparison, the original theatrical trailer and still gallery. The Black Camel includes commentary by film critic Ken Hanke, as well as a restoration comparison, the original theatrical trailers and still gallery. Side two includes Charlie Chan’s Chance: A Recreation, a dramatized recreation of the lost film, Charlie Chan’s Chance with an optional introduction by film historian John Cork. For all the latest info on upcoming crime DVD releases, check out the Crimespree Cinema DVD Calendar.